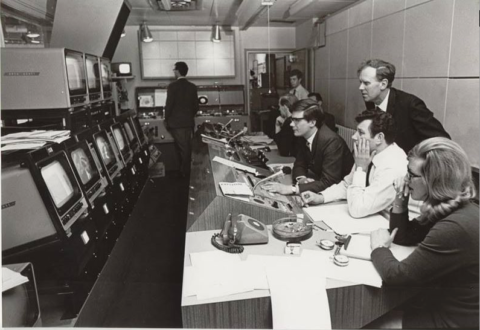 These photographs show the news studio gallery at Broad Street in the 1960s. In the second photograph you can see into the studio, through the window. The man in the white shirt is a young Jim Dumighan. These photographs were originally posted on the Pebble Mill Engineers Facebook group. Thanks to Stuart Gandy for allowing them to be shared. Colin Pierpoint: ‘I did a short time in there. 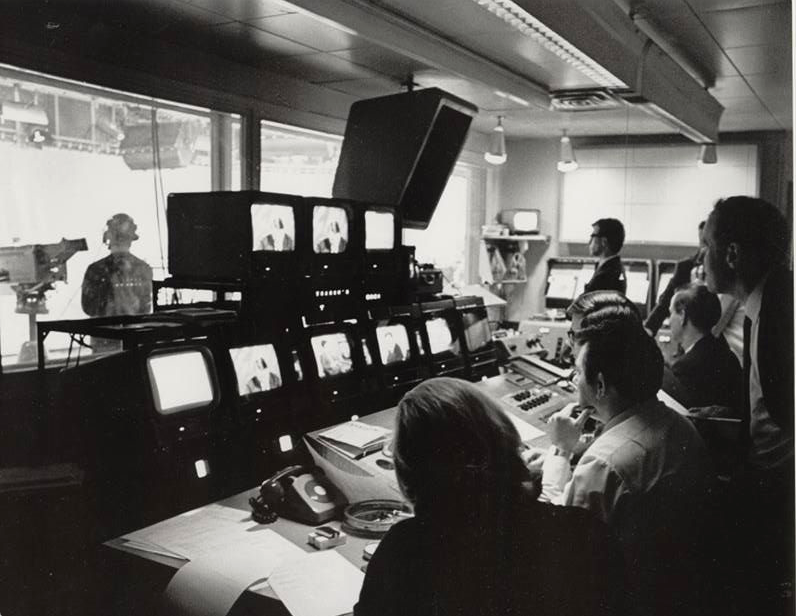 I didn’t do much except change a few caption cards in the studio, and I was on tape and grams at least once. The Director asked me for a particular sound effect, so I went to the F/X disc library to get one. When I returned I incurred the Director’s wrath for not being at my post when they had done a rehearsal! (In fact, I had left the tape machine on remote so the sound supervisor could start it). Photo 1: Sam Shaw standing at the back. I think the tape and grams operator may be Ant (Anthony) Astley. I too worked on FX in that gallery. It was live and sometimes you had never seen the mute film. ‘City Skyline’ ‘Cocktail Party’ and ‘Busy Trunk Road’ were our most used sound fx discs. Once used ‘Polar Bear Dives into Lake at London Zoo’ for swimming pool dive. Result was the sound of a huge splash; yet the diver entered the water like a knife!